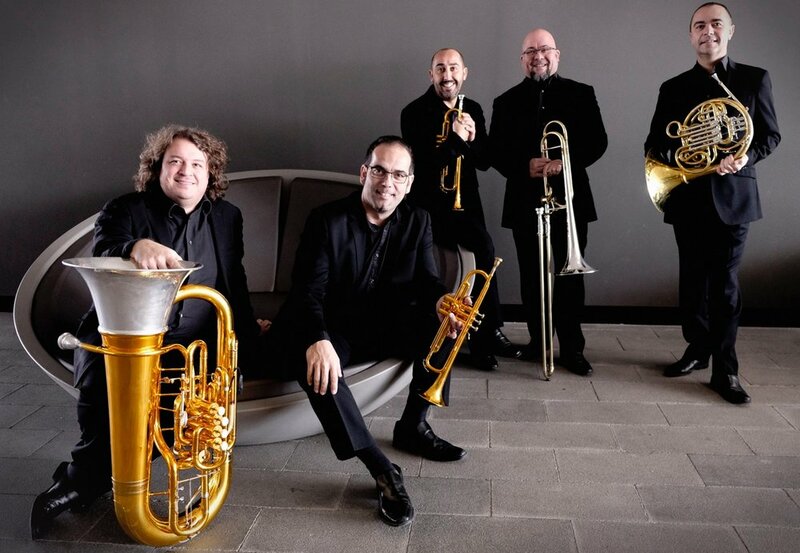 SPANISH BRASS was created in 1989 by five Spanish musicians as an innovative ensemble that quickly gained world renown for its performances, educational activities and creative collaborations. After they won the First Prize in the 1996 Narbonne (France) International Brass Quintet Competition, the most prestigious event of its kind in the world, trumpeter Bernard Soustrot said, "Of all the First Prize winners of the Narbonne Competition, the Spanish Brass is the best since the competition was founded in 1986. Spanish Brass has given hundreds of concerts across the globe, in such prestigious events and venues as the Great American Brass Band Festival; the New York Brass Conference; the Juilliard School of Music, the National Gallery in Washington, DC; Festival de Musique de Radio-France; Granada International Festival; Lucerne Festival; Cheju Summer Festival (Korea); Schleswig-Holstein Musik Festival (Germany); National Auditorium (Madrid); Palau de la Música (Barcelona); Kalavrita Festival (Greece); International Horn Society, Merano Brass Festival and Trento Philharmonic (Italy); Barcelona Auditorium; Festival de Inverno de Brasília, and countless others. Spanish Brass has been in the forefront of international music education, giving courses and master-classes with the Spanish National Youth Orchestra. the Youth Orchestras of Catalonia, Valencia, Andalucía and Madrid, the Hong Kong Academy for Performing Arts, Trumpet Lounge (Japan), the Showa School for Performing Arts (Japan), Lieksa Brass Week (Finland), the Eastman School of Music, University of Georgia, Venezuelan Youth Orchestra, Dartington International Summer School(England), International Winter Music Festival of Brasilia (Brazil), Ibero-American Cultural Festival (Puerto Rico), etc. In 2017 they received the I Bankia Music Talent Award in Spain, for the most influential musical artists. Spanish Brass also runs two major brass festivals in Spain: SBALZ Festival in Alzira (www.sbalz.com) and Brassurround (www.brassurround.com). A sampling of their international accolades includes: “They are one of the world´s finest brass quintets ranking up there with Empire Brass, Canadian Brass and American Brass” (Greg Alley); “One of the most exciting and artistic brass quintets to come on the scene in recent years … a gloriously brilliant performance” (International Trumpet Guild Journal); “They play with amazing cohesion, and set the highest standard for brass chamber music” (Maurice André, trumpeter); and “I cannot think of a better brass quintet in the whole world” (Christian Lindberg, trombonist). Among the most sought-after brass ensembles on American and international stages, SPANISH BRASS stands out in many ways, not least by featuring the passionate, Flamenco-flavored music of their native Spain alongside Dixieland, Baroque, Christmas, Latin-American and favorite brass standards. Their dazzling virtuosity and intimate, light-hearted audience rapport make each concert an unforgettable experience. SPANISH BRASS has given hundreds of concerts and masterclasses in such prestigious venues as the New York Brass Conference, Chicago Brass Festival, Juilliard, the National Gallery, and in nearly every musical capital in Europe, Asia and South America. "Spectacular. SPECTACULAR. One of our top 5 concerts ever. Those guys had the audience in a state of nirvana from the start. Really nice guys, Carlos is great talking with the audience—they jumped out to the reception immediately to meet, greet and sign CDs. We had one of the biggest audiences we've had in a long time, too. Thanks for everything—as usual, stellar group, but this was truly extraordinary." Thank you so much for bringing Spanish Brass to our series! They're phenomenal (!!!) - and . . . an absolute joy to work with - perfect gentlemen with beautiful spirits! . . . I would be happy to tell anyone that they're exceptional artists who also have the unique gift of being outstanding entertainers. Our patrons were absolutely ecstatic for them and we had huge numbers asking when Spanish Brass were coming back. I can't wait to have them back in a few seasons with a fiery Latin program." “The Spanish Brass concert was packed and rapturously received. And many in the audience seemed to be newcomers to our series, always a plus. In addition to the warm response of the audience, we sold many more CDs than usual!" "We couldn't be happier with both the concert and residency by Spanish Brass. They far surpassed our expectations for their concert performance and for being so caring with our students . . . the audience loved each piece, applauding much longer and louder than at other similar concerts we have sponsored. I could tell the audience was in love with them. I am sure we will have them back again!" —Don Sparhawk, coordinator, Center Stage at Brigham Young University-Idaho. "The residency with Spanish Brass was a fantastic success! They really did great work with our students and were so generous with their time. The students will be excited an motivated for weeks to come as a result of this event." "Last evening was a wonderful concert. It was one of the best attended in three seasons. The Spanish Brass presented a brilliant program encompassing music of so many genres and styles. Our audience was entranced and delighted. They gave the group a standing ovation and called for two encores. Cheers also to this brilliant work they do in the schools. We had the group present concerts at two schools on the San Carlos Apache Reservation and they had the kid’s attention throughout. Great musicians and great teachers. Carlos is a great moderator of the program. He easily adapts to the audience. We will keep them on our “bring back” list." "Spanish Brass was another home run for us on both fronts. Their school residencies were very well done and appreciated by our schools. The evening perfomance was one of the best attended we've had in quite a while. Standing ovation. These guys were awesome. You have a great porfolio of artists under your banner." "What amazing brass players . . . they were just terrific . . . They were fabulous . . . and got a RAVE review . . . And I'll send a copy to you. Such fun . . . too . . . Soooo good." "I can easily speak for myself and others to say that Spanish Brass was highly successful in every aspect: concert; pre-concert reception; post-concert dining; master class; post-master class lunch. Artistically, they are superb -- most certainly. They handled the master class with great skill and care. Personally, they are delightful in conversation and demeanor. We here totally enjoyed the guys. They seemed to enjoy being here: part of their charm! Lisa, you and I done good in making Spanish Brass in Temple finally work!" “The audience loved them. They were funny, charming and played the daylights out of their repertoire. I think they had a good time as well. They sold a lot CDs which is a great thing." “The guys were truly amazing, and the opportunity to have them here was extraordinary!! The concert exceeded all expectations - a full house, standing room only! The music was AMAZING, and the energy in the room was electric. As Carlos put it, ‘I don't know if we actually played better, but with an audience like that you feel like you play better!’ They really put on a spectacular show! The Master Class at NMSU was well attended and went over exceptionally well. We also enjoyed the chance to spend quite a bit of time together at meals out, supper in our home, some sight-seeing, etc. . . .
“The concert tonight was simply the best. We had a nearly packed house of folks that were transcended to a higher level. The quintet was spectacular in their precise playing (from pianissimo to very powerful fortissimo) and their professional, respectful presentation. And the program was so well engineered. From J.S. Bach to French and Spanish music to American classic jazz to an encore of a Dixieland version of the gospel tune, ‘Just a Closer Walk’ which left the audience on their feet for a second time. They are stud players and true professionals. Carlos did an exceptionally good job of introducing their selections. It was simply a super night . . .
“A great success. The audience loved them; good musicians and very entertaining. We had a good turnout, especially considering that on the same night was the Presidential debate on TV. With many thanks and best wishes,"
"It was great! The audience loved them. And we had some pretty interesting conversation at the reception afterwards. Thanks for bringing them to my attention."